Ketosis occurs when the fat in your body does not break down completely, producing ketones. It's a condition that can occur when you go on a low-carb diet and glycogen stores in your liver are depleted. When you have too much acid in your system, you can develop acidosis. The acid build-up can take place in your kidneys or lungs for a variety of reasons. The build-up of ketones can cause an imbalance that leads to excessive acid production. 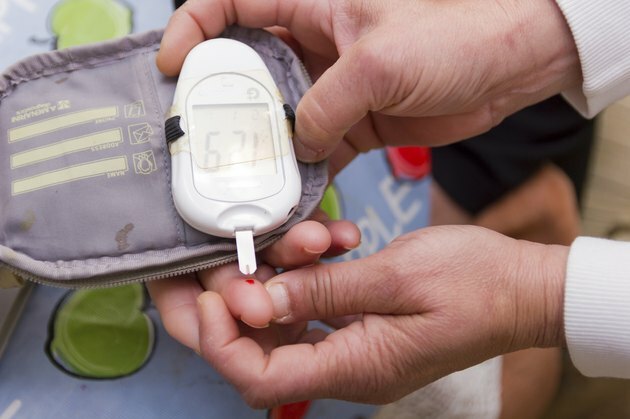 Diabetics may be prone to ketosis or acidosis when insulin levels drop below healthy levels or when ketones build up in the body due to uncontrolled insulin levels. Ketones are the byproduct produced when the body relies primarily on fat stores for energy. While short-term ketosis can help you lose weight, ketones that continue to build up in your blood and urine are poisonous and lead to diabetic ketoacidosis, also referred to as diabetic acidosis. The condition is a more common complication of Type 1 diabetes. In addition to low insulin levels, trauma, severe infection, a heart attack or surgery can lead to diabetic ketoacidosis. Diabetic acidosis requires immediate medical attention. As insulin levels drop, your body produces blood sugar by uncontrollably burning fat. Your body turns acidic as glucose begins to appear in your urine. As your body tries to find a balance, your breathing becomes deeper and quicker, leading to a temporary balance as you blow off excess carbon dioxide. Symptoms may start with confusion, thirst, fatigue and increased urination. You may become unconscious. As acidosis progresses, you can smell acetone on your breath. Symptoms usually appear quickly, so you should seek emergency treatment. A high fat and high protein diet that's low in carbohydrates can lead to ketosis. At the same time, you need to burn off all the carbohydrates in your system for your body to begin burning fat cells for energy. The balance is delicate and should be monitored by a doctor when you choose to diet by eliminating carbs completely from your eating program to prevent ketone poisoning. Initial side effects of a low carb diet include constipation, dehydration and the risk of developing gallstones or kidney stones. Lactic acidosis is another serious emergency condition that requires immediate medical attention. It occurs when your body builds up more lactic acid than it can expel. Lactic acidosis is a common side effect of diabetic medication called metformin, but also can occur as a side effect of AIDS, kidney failure, cancer or sepsis. Intense exercise is one of the most common causes of lactic acidosis, according to Medline Plus. You'll feel nauseous and weak when lactic acid builds up. Tests to check your electrolyte balance can detect excess lactic acid.